This is a very famous book, and one of the great horse book classics! Many girls (and boys) have learned to love horses and ponies by reading this captivating story. If you haven't read it yet, you'll want to put it at the top of your list! I LOVE IT, I used to get a copy at the library but now I have my own copy. YAAAAAAAAY LOL. I just love Misty of Chincoteague! I have also read other books with misty: Stormy, Misty's foal, Sea star, Orphan of Chincotaegue, and right now I 'm reading Misty's Twilight. My favorite book! I have read it 50 times and I named my horse after her. I haven't read this book but I've read Stormy, Misty's foal. It's a good book but also really sad. The book was pretty good, maybe boring in some places but mostly interesting. In some parts it seems to drag on, but in other parts it is action-packed. I think it's perfect for younger readers who love horses. It's a nice book. The storyline is very nice and I like the wild horses. However, there are some thing's I don't like. Pony Penning Day isn't good for the horses. When they cross the water, they get sick and are scared of crocodiles. Also, this book is very anti-women. The sequel Stormy, Misty's foal, is even more anti-women. As a girl, I find that very offensive. This book is definitely an oldie but a goodie. I read it with my mom and we agree it's one the best horse books ever-and I've read a lot of horse books! My mom showed me a copy of this book when I was 7, I think. I'm going on thirteen now and I've read it, maybe a hundred times! I love it! 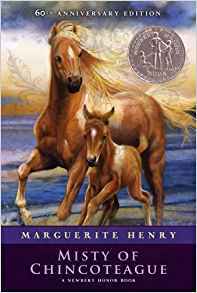 I've also read both sequels, Sea Star of Chincoteague and Stormy, Misty's Foal. I just can't get enough! This book is very good. The ponies are actually like chincoteague ponies (I have one) and the writing is amazing! Love it!!!!!!!!!!!! I really like the fact that it is based on a true story. If u like suspense, this is your book! This to me is one of the greatest horse books in the horse world! I have read this book! It is SOOOO good! I have read this book and recommend it! I have also read Stormy, Misty's Foal, and Misty's Twilight. Recommend them all!!!!! I can't wait to read this book!!!! I have read Misty's Twilight, whom in which is Misty's great grand foal. It is such a great book! I hope to read Misty of Chincoteague real soon! Did you know that the real Misty and Stormy (Her first foal) are stuffed (Like taxidermy) and on display in a museum on Chincoteague? This book is awesome! I love it! This book is one of my all-time fav's! I also love the sequels, Stormy, Misty's foal and Sea Star, Orphan of Chincotegue. This book is just a plain classic! I think it's one of my fave classics: and Chincoteague make a cute kids book! I think Misty portrays a funny main character too! This book is pretty good, i wouldn't say the best. I wish it was in more modern times and that they actually rode the horses and jumped and stuff. Overall it was a great book! This is my favorite book ever! It is about a girl and a boy who have their hearts set on owning a wild pony, named Phantom. When it is too late too buy them, a kind boy ends up giving them to Paul and Maureen. What will happen after that? You have to read the book to find out! i have stormy,mistys foal and it is really cool! Margerite Henry (the author) is great, so of course the book and the sequels are absolutely awesome! This book and any other books about misty are my favorits ever!!!!!!! I love Misty of chincoteague, It's a amazing book about a boy and a wild horse called the phantom. the boy catches the phantom and with it has the foal which they call misty. you will truly love Misty of chincoteague. congrats to the auther who wrote it so well!!! i love the book misty of chincoteague!!!!!!!!!!!!!! This is the first horse story my mom ever read to me and I just love it. I've read it myself since then. It's great.